Learn about alert conditions and states, when alerts fire, and how alerts resolve. 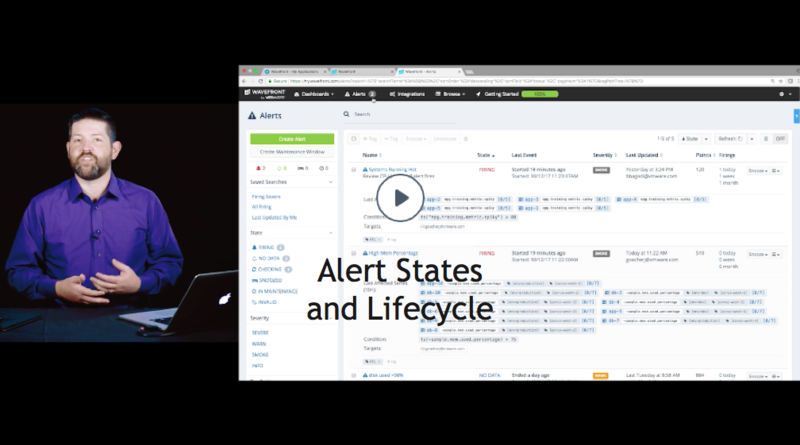 The alert lifecycle determines which events the alert triggers, and which alert targets get notifications. Classic and multi-threshold alerts are exactly the same in terms of events. However, when notifications are sent to which target differs for classic alerts and for multi-threshold alerts. Wavefront monitors the alert condition. When the condition is met for the specified amount of time, the alert fires. When the alert fires, Wavefront sends alert notifications to the alert target(s) specified for the alert, using the severity that’s prespecified for the alert. When the alert resolves or is snoozed, Wavefront sends additional notification to the alert target(s). Wavefront monitors the alert condition. If at least one of the threshold values is met for the specified amount of time, for example, if cpu.loadavg.1m is greater than 6000, the alert fires. Notifications are always sent to all alert targets that are equal to or below the severity that triggers the alert. For example, if cpu.loadavg.1m is greater than 6000 for 5 minutes, alert targets for SEVERE, WARN, and SMOKE are notified because the condition is satisfied for all. If the current value of cpu.loadavg.1m satisfies the WARN but not the SEVERE condition, then only alert targets in WARN and SMOKE will be notified. Wavefront continues checking the alert condition at the specified interval (1 minute by default). If the alert condition for the higher level is no longer met, but a lower-level condition is met, then the higher-level alert target gets an Alert Resolved notification, and the lower-level alert targets get an Alert Updated notification. CHECKING We check whether the Condition is met for the amount of time specified by the Alert fires property. Alerts can't be in the CHECKING and the FIRING state at the same time even though firing alerts are being checked to determine if firing conditions are still being met. An alert resolves and transitions back to CHECKING when no true values are present within the time window, or when the time window contains no data. 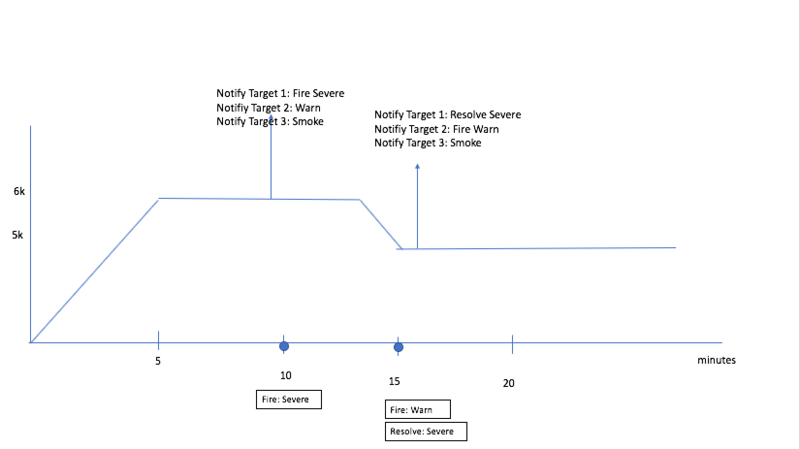 FIRING The alert is meeting the Condition for the amount of time specified by the Alert fires property. An alert transitions to FIRING when the condition evaluates to at least one true value and no false values during a fixed time window. NO DATA The series for which an alert is defined is not reporting data. You can set up an alert that triggers if the alert is in a NO DATA state for a specified amount of time. If you do, select Alert Has No Data in the corresponding Alert Target. For those alert targets, select Alert Has No Data Resolved if you want to send a notification when the alert exits the NO DATA state. IN MAINTENANCE The alert has an alert tag or a source or set of sources included in a source tag associated with an ongoing maintenance window. If an alert has a subset of reporting sources associated with in an ongoing maintenance window, then the state displays as CHECKING/IN MAINTENANCE. If an alert has a subset of reporting sources associated with an ongoing maintenance window but the other sources are firing, the state displays as FIRING/IN MAINTENANCE. INVALID The alert is timing out ( > 5 min query execution) or queries include inactive metrics or sources. When an alert is in the INVALID state, it is checked approximately every 15 minutes, instead of the specified checking frequency (see next section). SNOOZED The alert is not checked. The time series associated with an alert are checked to determine whether the alert should fire or not. The default checking frequency interval is 1 minute. This means that the conditional expression associated with the alert is evaluated once a minute. You can change this interval by setting the Checking Frequency advanced property when you create or edit the alert. The exact time of the check for a particular alert is not fixed and can vary slightly within the minute. For example, for a specific alert it’s possible that a check occurs at 1:01:17pm and the next check occurs at 1:02:13pm. Evaluates the ts() expression you specified in the alert condition. Implicitly aligns the returned values by grouping them into 1-minute buckets. Summarizes the values within each bucket by averaging them, and aligns each result at the beginning of the minute that contains the summarized values. Tests each average value (1 per minute) against the alert condition to see whether it evaluates to 0 (false) or non-zero (true). If the ts() expression returns a single data value per minute, the summarization values and the returned values are the same. Note: If you want a different summarization strategy, then you can explicitly use the align() function in your alert condition, with parameters specifying a 1-minute time window and your preferred summarization method. Suppose your alert condition is ts(my.metric) > 4, and my.metric reports 5 data values (9, 9, 9, 3, 9) between 12:11:00pm and 12:11:59pm. The alert checking process averages these 5 values to produce a single summarization data point at 12:11:00pm. The value of this summarization point (7.8) evaluates to true because 7.8 > 4. Suppose you want to know whether any single value within the minute would evaluate as false, even if all the other values would be true. You can explicitly bucket the values by changing your alert condition: align(1m, min, ts(my.metric) > 4). When my.metric reports the data values (9, 9, 9, 3, 9) between 12:11:00pm and 12:11:59pm, the align function returns the minimum value (3) as the single value at 12:11:00pm. The alert checking process evaluates this value to false, because 3 < 4. When an alert is currently not firing, the Alert fires property determines the time window that is evaluated. When an alert is currently firing, the Alert resolves property determines the time window that is evaluated. The data points that are evaluated during a check time window are the 1-minute summarizations described above. E.g., if the Alert fires property is set to 3 minutes, then the alert check evaluates 3 summarization data points, one for each minute in the check time window. We use this formula to ensure that the alert has a full minute’s worth of reported data to summarize and evaluate. The last summarization data point to be evaluated is at 1:08:00pm ((1:09:32 - 0:00:32) - 0:01:00). This point is the average of the data values that were returned by the alert query from 1:08:00pm to 1:08:59pm. The 5-minute time window includes the 5 summarization data points from 1:04 - 1:08. These points cover the data values returned from 1:04:00pm through 1:08:59pm. An alert fires when its condition evaluates to at least one true value and zero false values present within the given Alert fires time window. If the metric reports exactly one data value (5) in the last 2 minutes, and no other points (no data), the alert fires. Reason: The Alert fires window contains one true summarization value (5 > 4) and no false values. If the metric reports many points in the last 2 minutes, all of which are <= 4, the alert does not fire. Reason: The Alert fires window contains two false summarization values, because the averages of values that are <= 4 are also <= 4. If the metric reports many points in the last 2 minutes, all of which are > 4, the alert fires. Reason: The Alert fires window contains two true summarization values and no false values, because the averages of values that are > 4 are also > 4. If the metric reports exactly two data values (5 and 3), anywhere in the last 2 minutes, the alert does not fire. Reason: The Alert fires window contains one false summarization value. If each data value is in a different minute, then one of the summarization values is 3, which evaluates to false. If both data values are in the same minute, then their average (4) evaluates to false (4 > 4 is false). Alert checks are based on data that is summarized every minute. Consequently, if ts(my.metric) returns 5, 5, and 3 in the same minute, the summarized value (4.33) evaluates to true for that minute because 4.33 > 4, even though 3 by itself would evaluate to false. All alert queries are checked according to the Checking Frequency property. The alerts icon in the task bar shows the number of alerts firing and their severity. 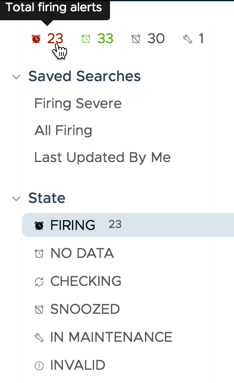 The filter bar at the left of the Alerts page shows the number of firing alerts by severity. For multi-threshold alerts, we list each alert only for the highest severity even if lower severity conditions are also met. An alert resolves when there are either no true values present within the given Alert resolves time window, or when the Alert resolves time window contains no data. By default, the Alert resolves time window is the same length as the Alert fires time window. The Checking Frequency interval = 1 minute (the default). Alert fires = 5 minutes. Alert resolves = 10 minutes. metric.name normally reports 0, but starts reporting 1 at 10:21. At 10:26, the alert fires, because metric.name has reported 1 during the 5 whole minutes (from 10:21 to 10:25) immediately before the alert check at 10:26. At 10:26, metric.name starts reporting 0 again. It stops reporting for a few minutes of no data, and then continues reporting 0. At 10:36, the alert resolves, because metric.name has reported 0 during the 10 whole minutes (from 10:26 to 10:35) immediately before the alert check at 10:36. Suppose the threshold for an alert is set to 50%, and the alert’s settings are Alert fires = 2 minutes, Alert resolves = 2 minutes, and Checking Frequency = 1 minute. An event window from 09:34 to 09:35 identifies the interval during which the metric crossed the threshold going up. An event window from 09:39 to 09:40 identifies the interval during which the metric crossed the threshold going down. The alert fires around 09:37:09 and resolves at 09:41:59. Why does the alert fire when it does? An alert check occurs at 09:37:09, and takes into account the 2 summarization data points at 09:35 and 09:36. Each summarization data point evaluates to true, because it is the average of values that are all > 50%. The alert fires because the alert check finds two true values and no false values among the summarization data points in the time window. Why does the alert resolve when it does? The summarization point at 09:40 is the average of values (all <= 50%) that were reported from 09:40 to 09:40:59. The summarization point at 09:39 is the average of the values (some > 50%, some <= 50%) that were reported from 09:39 to 09:39:59. The resulting average is 44%, which makes the summarization value false (44% <= 50%). The alert resolves because the alert check finds at no true values among the summarization data points in the time window. An apparent false positive, e.g., an alert that fires, but later looks like it shouldn’t have. An apparent false negative, e.g., an alert doesn’t fire, but later looks like it should have. Check for delayed data reporting. Adjust your alert condition to prevent the alert from responding until data reporting is complete.